We will have more varieties in 2019! Our favourite addition has to be Voodoo. We will be updating the product listings soon, so keep checking! All of the Scented Pelargoniums (sometimes known as Scented Geraniums) you see listed on our online shop can be purchased from our nursery. The online prices do incorporate some of the picking, packing and delivery costs so collecting direct from us can save you money! Our standard range (grown in a 10cm pot and the size offered online) are available from £2.00 but some rare or unusual varieties can be up to £4. Prices will be clearly marked on our sales benches. We grow many different varieties here on our nursery and on occasion our online shop may report a variety you need as ‘out of stock’. If you are planning a visit based on online availability, it is often worth giving us a call as we may still have that one Pelargonium to complete your list. 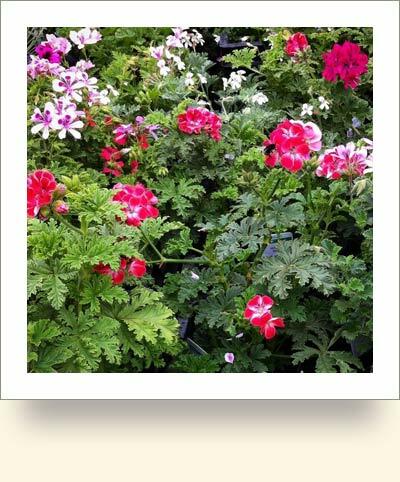 Our Scented Pelargoniums are grown from cuttings from our own stock and from stock of other growers. Although the most common varieties should be in plentiful supply, rarer species may not. For this reason, some varieties may be hidden from view on our shop so it is best to look in our catalogue for the full list of varieties we should have throughout the year.